One of the things that can make your heart sink is realizing that your gas boiler is leaking. Though it might be functional, a leaky boiler may not hold on for a long time. Well, in some cases, a boiler leaking water may not be a sign of a potentially dangerous issue. However, no matter how simple it may seem, you shouldn’t fix it on your own. Just like any other appliance, a boiler should be serviced by a qualified engineer. For one main reason, it’s illegal for any individual or a company that doesn’t meet the law requirements governing the domestic heating industry. Here is what you’re supposed to do in case of gas leaks in your home. 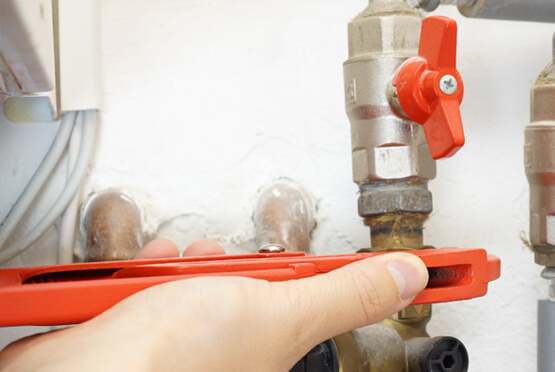 Switch off the gas main valve and get out of the property where you suspect there was a leak. Turn off the gas meter and avoid turning on lights. When flammable gases are exposed to fire or spark an explosion is inevitable. This is the main reason we strongly advise that once u detect a gas leak in your home you should get out immediately open the windows shut down the gas meter and the other suggestions we offer. Implementing this advice will put you in a better position to minimise the gas leak and the impact it might cause before our engineers arrive. The worst case of a gas leak is where carbon monoxide poisoning occurs. Keep in mind that this is a tasteless gas and has no smell whatsoever. Thus, detecting carbon monoxide is difficult unless you have carbon monoxide detector installed in your home. According to a study carried out sometime back, 200 people in the United Kingdom get hospitalized each year due to health complications associated with carbon monoxide poisoning. This study revealed that 50 people die each year due to carbon monoxide poisoning. Given an opportunity, we can help you deal with gas in the boiler leaks in your home effectively. Once you suspect your boiler is leaking or your gas is leaking, the best thing you can do is to contact us. As you wait for our engineers you shouldn't try to fix the gas leak on your own. Instead, focus on helping and the protecting your loved ones by getting them out of the house, opening the windows and doors, and shutting down the main gas valve. Your efforts to fix the mess may result in an explosion especially if the gas is highly flammable. This is because even a slight spark can light in the air. Not only does such an explosion result in property loss and destruction but also can cause death especially if there are people inside the house when the explosion occurs. Therefore, it's prudent not to fix the leak on your own but wait for our engineers to arrive.